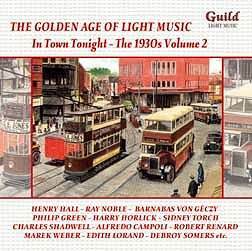 Showing no let-up and casting its net ever wider the Guild reissue team has sought further Light Music from the 1930s. A look at the orchestras and ensembles will show that, owing apparently to friendly constructive criticism, rather more continental examples have been included. It’s certainly time for Edith Lorand and her orchestra to get extra exposure – what about a retrospective of her best recordings? – and it’s equally good to see a stalwart of the recording studios like Barnabas von Géczy contributing a title. But in the main, despite these jaunts across the Channel (and the Lorand orchestra plays none other than Sidney Barnes’ Ecstasy Waltz) the focus is centred on Blighty. Philip Green has been a backbone of the Guild reissue programme and he contributes a rather Eric Coates-like Down the Mall whilst organist Al Bollington contributes some theremin like noises in Coward’s Bitter Sweet Waltz. There are a few show selections here, ones devised to run on both sides of a 78. Charles Shadwell, an experienced musician, waves the baton over the Coventry Hippodrome Orchestra in a 1935 selection; at the piano is Jack Wilson who infiltrates a little, knowing Harlem Stride. The Regal Virtuosi - one of the ancillary and pleasurable things about this series is tracking down the grandiose names of some of the theatre and cinema ensembles – don’t quite get into La Paloma whilst Alfredo Campoli and his Marimba Tango Orchestra (which just about covers it) certainly do their best by the Chinese Street Serenade. Though whether they should have bothered is another question. Kismet by Erich Börschel doffs its cap in the direction of the clarinet solo in Rhapsody in Blue and a different kind of popular music is explored by the capable Debroy Somers, whose redoubtable credentials as a show-band leader can clearly be heard here. Naturally there’s genuine Coates, performed by the pukka BBC Dance Orchestra "directed", not conducted, by Henry Hall. The much less well-known Robert Renard and his orchestra contribute a rather sturdy Donna Juanita – the Paso Doble seems to have been a spicy exotica during the 1930s – and there’s the unusual spectacle of Herbert Küster’s Piano Orchestra. Russian born Joseph Muscant and his Commodore Grand Orchestra have a decent stab at Ippolitov-Ivanov’s Procession of the Sardar, though the band sounds smaller then Grand – Compact, maybe. At the opposite scale we have the very swish Ray Noble and his New Mayfair Orchestra and as a bonus a 1934 experimental stereo excerpt from the same band. Those who know the Alan Blumlein experimental stereo Beecham discs will know what to expect. As ever the presentation is good; the copies used seem to have been in first class state, though they can sound a mite treble starved for my taste. How deep is Guild’s well?